The winegrowing region is the northern part of the area Languedoc-Roussillon in the deep south France on the Mediterranean coast. It covers the three départements from north to southwest Gard. Hérault and Aude, The much smaller one Roussillon in the department Pyrenees-Orientales closes west, the two wine-growing regions Provence and Rhone east to. The name derives from "langue d'oc", which means "language of the Oc" (oc = yes). 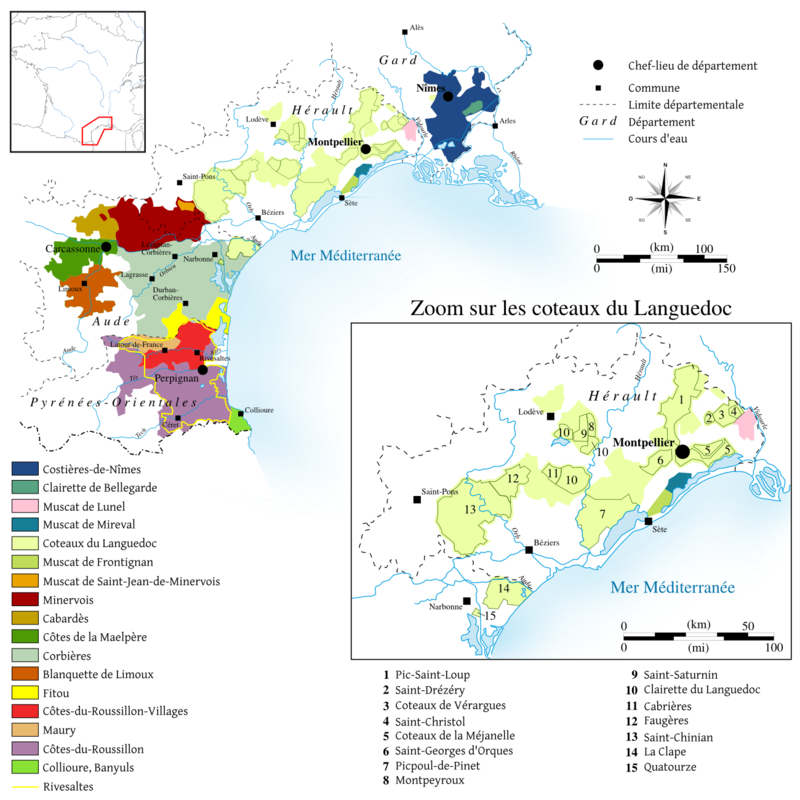 This Occitan language became south of the Middle Ages Loire spoken; north one spoke "Langue d'oil" (from "oil" developed "oui"). The two regions of Languedoc-Roussillon and Midi-Pyrénées were combined in 2016 to form the new political region of Occitania (French Occitanie). Long before the much more famous champagne Here was a sparkling sparkling wine, today's Blanquette de Limoux, A special form of alcoholic, sweet Vin de liqueur in Languedoc is the Cartagène, Until the 1980s, the Languedoc had the reputation of a mainly cheap mass wine producing winegrowing region. From the beginning of the 1990s there were subsidized by the EU clearing programs, This resulted in an extremely strong reduction of vineyards within ten years. The CIVL (Comité Interprofessionnel des Vins du Languedoc) has prepared a new classification for the region's wines, which came into force in 2011. The pyramidal hierarchy in ascending order is Languedoc , Grands Vins du Languedoc and Crus du Languedoc . The basis for the classification are qualitative and economic criteria (among others, certain distribution channels and minimum selling prices are required). A wine must fulfill certain characteristics and undergo a recording procedure above the simple AOC Languedoc to be classified in the corresponding higher category 2 or 3. The small appellations should thereby in their terroir emphasis be strengthened. The vineyards cover about 10,000 hectares, of which about 20% of the wine production of the area come. Red and rosé wines are blended from Grenache Noir, Mourvèdre and Syrah (to 50%), as well as Llladoner Pelut, Carignan Noir, Cinsault, Counoise, Grenache Gris, Terret Noir and Piquepoul Noir (up to 50%). White wines are produced from Bourboulenc, Clairette, Grenache Blanc, Piquepoul Blanc, Roussanne, Marsanne and Rolle (at 70%), as well as Carignan Blanc, Macabéo, Terret Blanc, Viognier and Ugni Blanc (maximum 30%). Maximum permitted yields are 50 hl / ha for red and rosé and 60 hl / ha for white wines. The second stage of Grands Vins du Languedoc accounts for around 70% of the wine production. These include (except, of course, AOC Languedoc) most of the appellations listed below. These are structured, aromatic Plants that are typical of their terroir. The provisions regarding varietal mixtures are individual and listed there. The maximum permitted yield is 48 to 50 hl / ha. At the top of the pyramid are the Crus du Languedoc with about 10% of the wine production. These most expressive wines have according to the specification "rarity value and bear the handwriting of the producer". White wines have to be aged for at least six months and red wines for at least twelve months. A sensory Examination is required. At least 70% of the production must be sold directly from the winery. Maximum yields are 45 hl / ha for red wines and 50 hl / ha for white wines. Among the most famous producers in the region include, among others Domaine L'Aigueliere Mas d'Andrum, Domaine d'Aupilhac, Domaine Bassac, Château Belot, Domaine Bourdic, Mas Bruguière, CV de Cabrières, Domaine le Cazal, Domaine de Cazeneuve, Domaine de la Coste, Château de l'Engarran, Mas de Daumas-Gassac Mas d'Espanet, Château de Flaugergues, Domaine de la Grangette, Domaine Guiraud-Boyer, Domaine de Laballe, Château de Lascaux, Château Notre Dame, Domaine Peyre Rose, Château Peyriac de Mer, Château Puech-Haut, Domaine Pujol, Domaine Rocher des Fées, Château de Roquenégade, Domaine de la Roque, Domaine de Sainte Rose, CV of St-Saturnin, Les Trois Blasons, Domaine du Temple and Maison Maurel Vedeau. This page was last modified at 21 February 2019 at 19:37.